A bird (flying up the center of the image) crosses the face of the sun at the same time as the International Space Station (diagonal path) in this composite image released Oct. 4, 2017, by the European Space Agency. The astronomy club at the agency's European Space Astronomy Centre near Madrid, Spain, took the photo in 2013. Talk about timing! Photographers with the European Space Agency hoping to spot the International Space Station crossing the face of the sun got more than they bargained for in this sunny snapshot. "It requires planning, patience and a measure of luck," ESA officials wrote in an image description. "The camera must be set up at the right time in the right place to capture the Space Station as it flies past at 28,800 km/h [17,900 mph]. At such speeds the photographer has only seconds to capture the transit, and if any clouds block the view, [they'd have] to wait for another opportunity weeks later." While the skies were clear of clouds for this station-sun photo, at least one feathered flyer was in the viewing area. "The station flies around Earth at [a distance of] around 400 kilometers [about 250 miles], allowing the astronomy club to calculate that the bird was flying 86 meters [280 feet] from the camera lens," ESA officials wrote. "The difference in size and distance makes both the bird and the space station appear the same size." 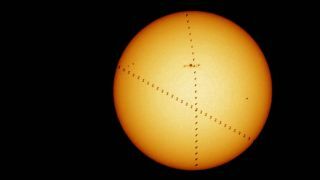 When the space station crosses the face of the sun, it is known as solar transit. Such transits can also occur other planets or stars, or with Earth's moon, as in this case of this stunning view of the station crossing the nearly full Harvest Moon captured this week by photographer Alexander Krivenyshev. Editor's note: If you have an amazing photo of the full moon or any other night-sky sight that you'd like to share with us and our news partners for a possible story or image gallery, please contact managing editor Tariq Malik at spacephotos@space.com.